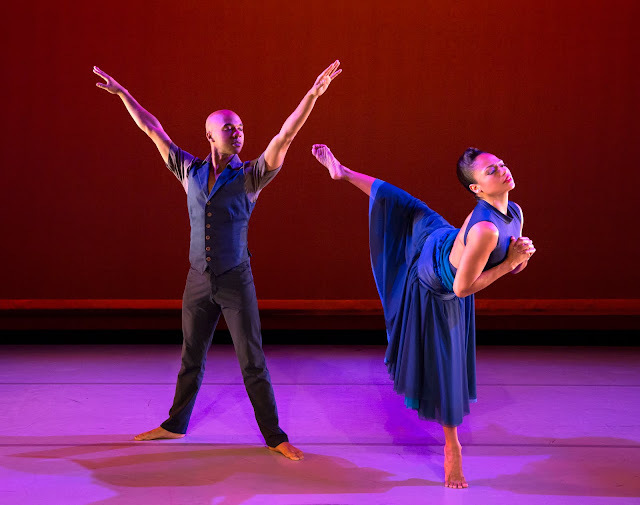 As the Alvin Ailey American Dance Company enters its fifth year under the leadership of Robert Battle, at least one program in its City Center season showed that the future is now—but with a twist. On Dec 17, a slate of premieres/new productions, the past was represented by a company premiere of Paul Taylor's Piazzolla Caldera (1997). It led a program fleshed out with new work by Ronald K. Brown, Kyle Abraham, and Battle. None of it felt like familiar fare by Ailey, which peppers most other evenings throughout the month-long run. And a subtle link between Battle and Taylor underscored an affinity for dark narrative, and a generational legacy. Awakening, by Battle, began with a bang: John Mackey's brass instrumentals blasting at air horn-volume, quickly chasing some viewers out of their speaker-adjacent seats. The dancers, in uniform white tunics and pants which could be interpreted as asylum or spaceship gear, darted and pivoted in a V formation, seemingly in hasty desperation. The lights, by Al Crawford, at first lit only their shins; this horizontal motif echoes in a crosswise white slit that cleaves the black cyc in half. There's a general sense of revolution and apocalypse. The group coalesces, gazing in one direction, then splits and careens around the stage once more. Jamar Roberts emerges as the leader, coiling and unfurling amid the turmoil of the crowd. Interestingly, for me this work evokes the drama and tumultuous underlying narrative of Paul Taylor's The Word and Speaking in Tongues. This makes sense given Battle's place on the Taylor family tree, beginning as a prominent dancer and choreographer in ex-Taylor dancer David Parsons' company. In Awakening, the group feverishly follows its leader, whether for dogmatic or militaristic reasons. And the rhythmic, staccato phrases remind us of how different Battle's own work is than Ailey's fluid, classical jazz vocabulary. Piazzolla was set on Ailey by Taylor alum Richard Chen See. In theory, it should be an ideal work for Ailey—sultry, athletic, atmospheric. But from the important opening passage—here danced by Jamar Roberts; for Taylor by Michael Trusnovec—it was clear that Ailey's version would be softer and far less aggressive than the original. Trusnovec dances it with scalpel-like precision, imbuing social dance with a feral menace. Roberts looks terrific but passionless; his performance lacks the necessary darkness. Linda Celeste Sims, in the lead female role, dances with more attack, although as the despondent outcast, she seems more hungry than truly desperate. Kyle Abraham choreographed Untitled America (First Movement), a brief trio to a touching song by Laura Mvula. This premiere is about the long-term effects of incarceration, though its unspecific gestures suggest emotional turmoil between closely bonded loved ones. Jacqueline Green's lucid, long lines highlighted this installment of what should be an interesting final serial. Capping off the evening was Ronald K. Brown's premiere, Open Door, a timely paean to Cuban culture with music by some of its best-known musical sons including Tito Puente and Arturo O'Farrill. Brown can make dances with narrative or historical subject matter, but this dance is simply a full-blown physical celebration. Making it even more joyous are Linda Celeste Sims and Matthew Rushing leading eight dancers in pulsating, rippling vamps that traverse and follow the stage's edges. It's a classic Brown combination of grounded African moves embellished with quirky arm gestures, like brushing something off the shoulder, or arms held at 90º around the face. But never mind the details, what's important is that the company looks absolutely elated during the piece. Rushing can't suppress a huge smile, and Sims beams right back at him. We in turn absorb and reflect all that love back at them, and on and on. Meanwhile, Ailey's legacy is maintained in repertory, foremost by Revelations, by far his finest dance. But the growing prominence of the school of Paul Taylor, whether through his own work or in Battle's, cannot be overlooked, alongside premieres by some of the bright younger lights of contemporary dance. At the same time, Taylor is welcoming in other modern choreographers' work, both old and new. It's an interesting time for the giants and legatees of modern dance, indeed.